A night of three distinct performances exploring ghosts as socio-cultural movement and human energy from without and within. 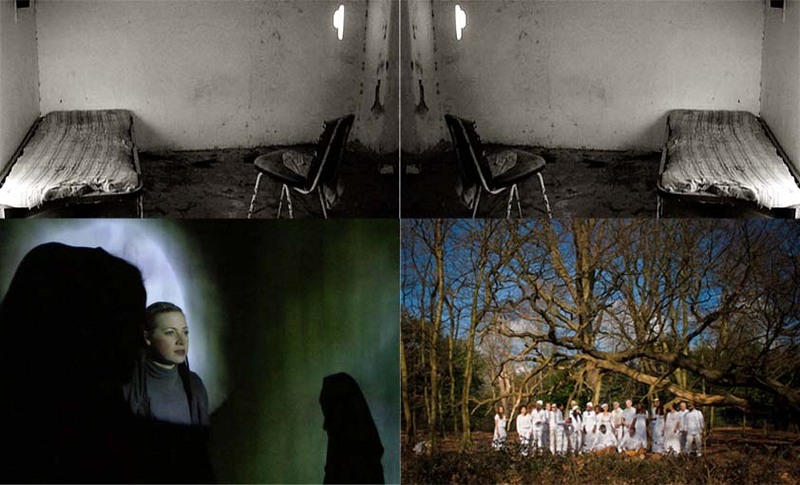 GHost hosts an evening of cross-disciplinary performance which continue to explore the GHost-dance theme. I Am Still Within You. Eleanor Clare, Kam Wan and Marcus Davidson. “The house I had they took away from me. The times happened to be unpropitious: war, destruction, exile. sometimes, when I stop to think……………. HOME is of an immersive live sound, movement and projection performance consisting of drones and sonic explorations, utilizing manipulated and effected instruments and imagery, field recordings, voice and text, creating an atmosphere of sorrow and longing. Referencing the ghost of deracination, and the idea of the created boundaries between migrating societies and their cultures : utilizing an empty interior as a signifier for the longing and sorrow for the lost ‘home’ to animate the movement between the two places of physical and psychological dislocation. and carry their memories in music & dance”. 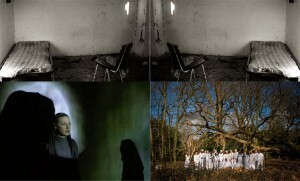 Stasis73 formed in 2009 by a collective of creatives from Hastings, film makers, painters, writers and musicians. The aim of the project is to move beyond the concerns of more traditional music making, yet not fall into the trap of being labelled experimental. Live sound and film installations of drones and sonic explorations, utilizing electro-acoustic manipulated pure noise, voice, text, whisperings, field recordings, decay, extended drones, and original, found & archive imagery, creating a multi-layered environment. The suggestion of a journey, magical and mystical, at times painful; the need to connect to something constant. Between darkness & twilight is where this work belongs: a sight just half seen. Visions appear transiently in the space between sleep & waking, the unconscious and conscious. The moon becomes symbolic because of its association with the feminine and its constant transformation from dark to light. One can take solace in the idea that there is something (albeit elusive) which resides through the process of change, dispersion, disintegration and regeneration. I Am Still Within You is devised by Eleanor Clare, Kam Wan and Marcus Davidson. It will be performed by Eleanor Clare, Alexandra Anzemberger, Sharon Bowen & Maddy Cullen. During the performance, singers move through the darkness. At times they will be lit by the projection, but the emphasis will be on the affect of their voices in the space, and the movement of sound with a sense of physical presence. Eleanor Clare, Kam Wan and Marcus Davidson have been collaborating on this project since 2013. The concept was initiated by Eleanor Clare, through lyrics and a basic melody, with an idea of moving through darkness. 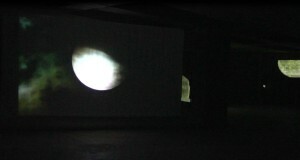 Kam Wan created and devised the film projection and installation, using footage of the moon which he had been collecting over time. Marcus Davidson created the sound track and the vocal harmony, working with his own research into music devised from the sounds of space. The genesis of this project can be traced back to the artist and composer Ellen Southern, who invited Eleanor Clare to produce new work taking inspiration from her remix score of ‘The Brilliant and the Dark.’ The showing of this work is kindly supported by Bergen Kommune, Norway. 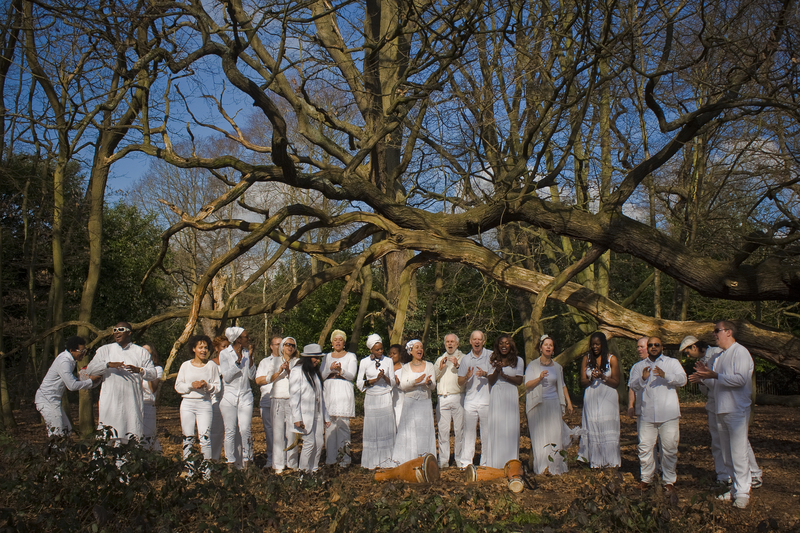 THE LONDON LUCUMI CHOIR: The London Lucumi Choir was formed in November 2006. It is still directed and led by one of its founder members, Daniela Rosselson De Armas, who is a musician and a Priestess of Oshun. It is an unusual choir which sings songs for Orisha; deities that mediate between human beings and God ( Olofi) as sun in Cuba and other countries in the African Diaspora. Although it is a non audition community choir, it works with highly qualified and knowledgeable artists and priests of the tradition. The songs that are sung within the choir are cultural representations of songs that are actually sung today within ceremonial contexts. They are accompanied by Bata drums. Bata drums are three drums that are played together to form complex rhythms that also connect to what is being sung. In a ceremonial context, the songs’ purpose is to “bring down” the Orisha to “mount” their initiates. The Orisha then dance, cleanse and give advise to the congregation. Obviously in a performance or cultural context this does not happen! The choir became finalists of the BBC Radio Three choir competition of the year in 2008 and have opened for big stars such as Eliades Ochoa ( Buena Vista Social Club) and Buika. They have performed at festivals, charity events, clubs and conferences and educational days at schools and are looking forward to playing at GHost. The performance at GHost Hostings will demonstrate a selection of songs to Orisha illustrated by dance moves which show the energy of the different Orisha by Afro Cuban Dancer, Yolanda Perez. It will be accompanied by a slide show which demonstrate Religious Altars, Orisha in nature and some wonderful art work by Contemporary Artists, Janine Francois. ( introducing Oshun) and Jacob V Joyce. Jacob will also be giving a run down on each Orisha in his own, inimitable style.